Compact and filterless 20000lm 4K+ solid shine laser projector. Stunning image quality in a compact body designed for live events and large venues. 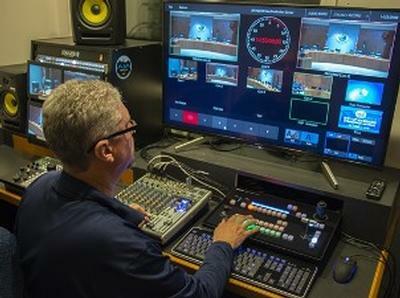 NEWARK, NJ (October 18, 2018) – Panasonic’s new AV-HLC100 Stream Studio has become the hub of wide-ranging video production for the City of Kissimmee, located in central Florida. The City operates a 24-hour government TV channel, Access Osceola, which is also supported by four AW-HN130 three-chip FHD PTZ cameras and two AU-EVA15.7K handheld cinema cameras. The HLC100 is an all-in-one professional live streaming solution that includes an integrated PTZ camera controller, built-in audio mixer, titler, clips/stills player, multi-destination stream encoder, and much more in a single device. The HLC100 makes it possible for one person to operate everything from PTZ camera shooting to streaming transmission. Beyond the central assignment of providing live coverage of the City’s bi-monthly council meetings on Access Osceola and the City’s website, Kissimmee’s Communications & Public Affairs Office also produces a multitude of civic and educational videos for broadcast and web consumption. In addition, Access Osceola delivers production support to City Departments, as well as County partners including, The Sheriff’s Office, Supervisor of Elections Office, and the water and power utilities. Assignments for these partners range from producing social media content and Public Service Announcements (PSAs) for local TV stations to live event coverage. He added, “The HLC100 streamlines live broadcasts on our access channel and live streams on our website. We can stream and record simultaneously for easy archiving. Also, the HLC100 has a small footprint, a crucial consideration as we operate our control room out of Access Osceola’s office in City Hall. Rodriguez explained that the four HN130 PTZs are permanently installed in the Commission Chambers, likewise located in City Hall. The new HN130 has built-in Network Device Interface (NDI) support, which links the camera directly to an NDI network with automatic detection by the HLC100. The NDI connection established between the HLC100 and the PTZs facilitates full control of the remote cameras and requires no additional menu configuration. The Panasonic equipment has been up and running at Kissimmee City Hall since early summer, which represents live coverage of more than a half dozen major council meetings, election debates and daily production projects for the City and its partners. “We’re seeing excellent all-around performance, and all of the gear is running smoothly,” Rodriguez noted.